Of the Optical Access Network (OAN), the Optical Distribution Network (ODN) is a key resource and an important asset for operators. In addition to vigorously deploying home broadband services based on Fiber-To-The-Home (FTTH) technology, operators also actively develop other services and explore new business models including network leasing/sharing to boost revenue and shorten the investment return cycle. In a multi-service scenario, the access network concurrently provides access to multiple services. In other words, the multiple services share the same access network. The operator uses the access network to operate multiple services while also offering differentiated service assurances. Typical fixed-network multi-service scenarios include home broadband as well as government and enterprise business. The most commonly used 5G multi-service scenarios are enhanced Mobile Broadband (eMBB), massive Machine-Type Communication (mMTC) and ultra-Reliable Low Latency Communication (uRLLC). Multi-tenant sharing allows an access network to simultaneously provide services for multiple operators. That is, the multiple operators share the same access network. The operator which owns the access network is called the Infrastructure Provider (InP), while an operator that leases the access network for service operation is an Virtual Network Operator (VNO). As agreed in a business contract, the InP logically partitions the access network and assigns the resources of a logical partition to a VNO so that the VNO can independently operate them. Multi-service and multi-tenant can be understood as two dimensions of access network sharing. Multi-service is the horizontal dimension, where the access network is shared by different services; multi-tenant is the vertical dimension, where the access network is shared by different operators. The two dimensions can exist concurrently. For example, suppose a public access network is planned in the Xiongan New Area in China’s northern province of Hebei. The access network can be shared by the three major operators in the country – China Unicom, China Mobile and China Telecom. Meanwhile, each operator can operate multiple services such as home broadband, base station backhaul and enterprise leased line. In a complex access network sharing scenario where multiple services and tenants co-exist, different VNOs provide their users with services that fulfil respective Service Level Agreements (SLAs). The access network has to both support concurrent, independent management by multiple VNOs and provide differentiated QoS assurances for multiple services. To implement multi-service access and multi-tenant sharing of the optical access network, the InP must plan the network architecture evolution and select the ideal new-generation optical access solution. Network Functions Virtualization (NFV) is a technology that provides Network Function as a Service (NFaaS) capabilities. Through the introduction of NFV, the network function requirements of different roles in the access network, including the end users, VNOs and InP, can be met in a complex sharing scenario with multiple services and tenants. Currently most network devices are purpose-built in their entirety or their hardware. Moreover, they come from only a few vendors, cost a lot and are difficult to scale. These problems can all be addressed by NFV. Employing techniques including functional analysis, logical partitioning, Network Function (NF) module setup, NF module function definition, NF module interface definition and NF module development, NFV enables one or more Virtual Network Functions (VNFs) to run on Commercial Off-The-Shelf (COTS) hardware. Thanks to NFV, a combination of COTS hardware and VNFs can even be used to replace some types of purpose-built network devices and network hardware. NFV decouples network functions and purpose-built devices, offering operators more choice and greater flexibility in the use of network equipment. In addition to purchasing hardware like blade servers and storage devices off the shelf, operators can even develop VNF software to implement specific service management and control functions to provide differentiated services. On-demand network connectivity to allow for easy control of the network connections between end users and VNFs. VNFs as a service to facilitate customization by VNOs. NFVI to let VNOs develop their own VNFs. As a new-generation OLT that supports NFV evolution, the ZTE TITAN is perfectly suited to deliver multi-service and multi-tenant applications in an access network sharing scenario. The NFV deployment strategy of the TITAN complies with the TR-384 specification – Cloud Central Office Reference Architectural Framework – of the Broadband Forum (BBF). Some highly real-time service management and control functions, including PLOAM and DBA of GPON as well as LACP, xSTP and OAM of Ethernet, are implemented as Physical Network Functions (PNFs) and kept in the TITAN. The other management and control functions can be deployed according to customer requirements either in VNFs in the cloud or in PNFs in physical devices. A highlight of the TITAN being applied in an access network sharing scenario is the implementation of physical resource abstraction, data modelling and resource mapping on generic compute and storage resources in the cloud. This implementation is mainly carried out by ZTE’s ElasticNet Unified Management Expert (UME) R20. The UME runs on the cloud and consists of two layers. The southbound or lower layer maps physical resources, while the northbound or upper layer abstracts virtual resources. In its physical resource mapping layer, the UME sets up a 1:1 Physical Access Node (pAN) data model for each physical OLT. By using an independent data store to save the static configuration and dynamic status information of every pAN, the UME supports the offline configuration of physical access devices. Multiple physical resource management and control module instances can be created in the physical resource mapping layer. Each instance can concurrently manage and control multiple and various pAN entities. For example, for different OLT models (C610, C650, C600, etc. ), their software and hardware characteristics are represented in corresponding pAN data models. 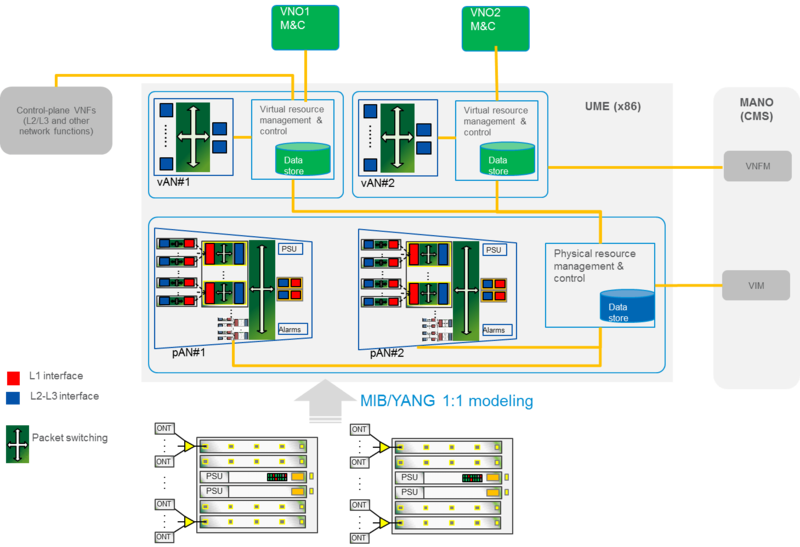 In addition, under the UME, multiple pAN devices connected by physical links can be simulated into one pAN device to implement cluster management and control based on multiple-to-one mapping. In the virtual resource abstraction layer, the UME extracts pAN data instances related to the access-network-sharing services. Such instances include logical Ethernet subinterfaces, forwarding instances, Traffic Management (TM) characteristics (scheduling and rate limiting), Performance Management (PM) characteristics (statistics), and alarms. Meanwhile, the UME ignores the information or characteristic irrelevant to the access-network-sharing services, such as power supplies, fans and line cards. By combining resources as needed, the UME creates a logical access device entity, establishes a data mapping link, and sets up a corresponding vAN data model. Resource combination can be based on a service, a VNO, or a service of a VNO. As in the physical resource mapping layer, the UME uses an independent data store to save every vAN and support the offline configuration of logical access devices. Compared with the pAN, the vAN data model focuses on service description. For example, the vANs of the OLT usually adopt an L2 Ethernet switching equipment model, while related characteristics of L1 interfaces (such as PON ports) are kept in the pANs. A pAN is an abstraction of a physical device and a vAN is an abstraction of a logical device. When the UME processes the two levels of abstraction, it supports capability adaptation and capability coupling between pAN and vAN. For example, the resource isolation level supported by physical devices will affect the configuration mode of the vAN. A case in point is that the C300 OLT supports isolation between forwarding instances including VLAN and VRF but not between packet buffer and MAC address table. In the UME, the pANs of the C300 will display this isolation capability. When the UME manages multiple vANs of a pAN in the C300, it will use this capability and employ techniques like address isolation/arbitration to prevent logical resource conflicts between vANs. The virtual resource abstraction layer of the UME provides stakeholders like VNOs with programming interfaces for virtual access devices. The physical resource mapping layer of the UME offers management and control interfaces for physical access devices. The plug-ins of a third party can be used to manage the access devices of the same party. The UME supports several mapping modes between physical and logical devices, such as one-to-multiple slicing mode (where one physical device is partitioned into multiple logical devices) and multiple-to-one expansion mode (where multiple physical devices are merged into one logical device). The deployment of the UME is based on an NFV architecture that uses off-the-shelf compute and storage resources. It supports virtualization technologies including virtual machine and container. Microservice techniques are leveraged to enable independent evolution and flexible expansion of different management and control functions as well as different instances in the UME. ZTE’s access network NFV solution steers a path of evolution from a single FTTH scenario to multi-service and multi-tenant scenarios. With the solution, the end users, VNOs and InP can define their own VNFs and build their respective virtual access networks according to their different roles in the access network. This capability of the solution ultimately enables the implementation of an access network infrastructure shareable by multiple services and tenants.